We’d love your help. Let us know what’s wrong with this preview of Yellow Locust by Justin Joschko. Forced to flee the tyrannical state with her younger brother Simon in tow, Selena is now the last chance for peace in a continent on the verg Selena Flood is a fighter of preternatural talent. But not even her quick fists and nimble feet could save her parents from the forces of New Canaan, the most ruthless and powerful of the despotic kingdoms populating America-that-was. To ask other readers questions about Yellow Locust, please sign up. Month9Books PR No, there is a sequel coming out in March 2019! I received a free eARC from the publisher in exchange for an honest review. Selena and her brother have to escape tyrannical New Canaan. They have to make sure that the information on data stick that got her parents killed makes it to the Republic of California, the only place left that stands for peace and freedom. The two siblings are the last hope for their mostly ruined continent before it's entirely too late. They've got thousands of miles on the road ahead of them through the Middle Wastes I received a free eARC from the publisher in exchange for an honest review. Selena and her brother have to escape tyrannical New Canaan. They have to make sure that the information on data stick that got her parents killed makes it to the Republic of California, the only place left that stands for peace and freedom. The two siblings are the last hope for their mostly ruined continent before it's entirely too late. They've got thousands of miles on the road ahead of them through the Middle Wastes and they'll have to deal with everything from murderers and thieves to a poisonous grass called yellow locust which has made growing food next to impossible. Fallowfield is practically an oasis in the midst of the wasteland - everything seems far too good to be true. As Selena begins to uncover the secrets of the town and its leaders, she'll have to use the fighting skills that she was forced to hone back in New Canaan if she and her brother are going to make it. Whatever she does, it'll have to be soon because all-out war is imminent and New Canaan is never all that far away. 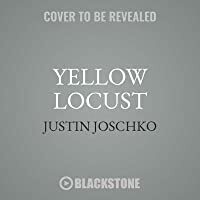 I'm so glad the publisher, Month9Books, approached me to try Yellow Locust by Justin Joschko. This novel doesn't release until May 8th, but it's a pretty great upcoming YA dystopian sci-fi story that definitely deserves attention. I've read quite a few dystopias, but it's been a little while since I've tried a new one that really stood out (the last being Want by Cindy Pon). Joschko's novel can also be considered cli-fi (climate fiction), a genre that I haven't read all that much of. If you're unfamiliar with it, it's a genre that explores environmental degradation and it's effects on human civilization due to climate change. It doesn't necessarily have be be speculative, but it is in this particular case. Joschko's novel firmly held my attention throughout from beginning to end, particularly developing his world, which is almost beyond hope, and the journey his characters take across what was once America - as well as the mystery surrounding Fallowfield. As for our cast of characters, I could appreciate really appreciate Selena's attitude and drive in regards to her family and duties. Plus, I could certainly relate to Simon's sensitive, fair skin - been there, done that. I should also mention that the author is good at crafting action scenes. There are plenty of great showcases of Selena's formidable talents. My only real issue is that Selena doesn't feel all that unique in comparison to other YA dystopian leading ladies, in fact she reminds me of a combination of Saba from Blood Red Road and Katniss from The Hunger Games. Yellow Locust is definitely not the normal book I would pick up. I was pleasantly surprised that it kept my attention and was enjoyable. The writing is fantastic! The flow of the book is easy and the character development is nice. I felt like at times characters were brought it and focused on a lot, for no reason though. This book is chemical warfare meets Fight Club plus the Civil War. Besides that, I really get Hunger Games, The Chemical Garden trilogy, and Maze Runner type vibes. This story definitely makes you think about what our country could turn in to if resources were scarce and monitored. It's a tad scary to think about. Selena and Simon are brother and sister fleeing from one coast of the US to the other. New Canaan is a vicious place to live. The Archbishop is cruel and is no stranger to boiling people alive in oil for not aiding in his cause. Selena's mom and dad are sympathizers with the Republic of California and have information that is crucial for the Republic to survive and take on New Canaan. When things go wrong, Selena is entrusted with a data stick that holds the key to beating New Canaan and sets out with her little brother on a long and dangerous trek across the country. The data stick in question has the "solution" to a troublesome weapon called Yellow Locust. Yellow Locust is the deadliest type of weapon in the sense that it's a weed that will take over any and all crops. It can't be killed...or eaten...and destroys any healthy crop it touches. There are many characters in this book, some better introduced than others. I really enjoyed Marcus. He was an interesting character and I wanted more of his back story. 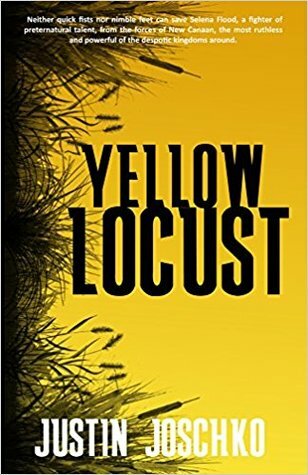 Yellow Locust is an entertaining read taking place in the dystopian setting of America split into several small republics and city states fighting for control and fertile land after the biological weapon "Yellow Locust" has destroyed most regions' supplies and grounds. The book follows the journey of the two Flood siblings, Selena and Simon Flood, who are on the run from their extremist home state New Canaan after having obtained a data stick containing New Canaan's plans to conquer the free Rep Yellow Locust is an entertaining read taking place in the dystopian setting of America split into several small republics and city states fighting for control and fertile land after the biological weapon "Yellow Locust" has destroyed most regions' supplies and grounds. The book follows the journey of the two Flood siblings, Selena and Simon Flood, who are on the run from their extremist home state New Canaan after having obtained a data stick containing New Canaan's plans to conquer the free Republic of California - the only nation able to stand against New Canaan conquering the country and turning it into an extremist nightmare. I did enjoy the setting of the novel a lot, and the author did a great job at world building and transporting the reader into the grim setting of the book. Fans of dystopian settings and strong female protagonists will enjoy this novel. 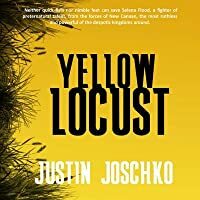 Yellow Locust by Justin Joschko is a far future dystopia where famine and war have decimated the North American continent. Selena and Simon Flood live in the tyrannical country of New Canaan. Following the fall of the tiny, prosperous territory of Niagara, New Canaan sets sights on the Republic of California, far across the Middle Wastes. When Selena's parents acquire data on a terrifying new weapon they make plans to get it to the Republic, a last bastion of democracy. The elder Floods send the Yellow Locust by Justin Joschko is a far future dystopia where famine and war have decimated the North American continent. Selena and Simon Flood live in the tyrannical country of New Canaan. Following the fall of the tiny, prosperous territory of Niagara, New Canaan sets sights on the Republic of California, far across the Middle Wastes. When Selena's parents acquire data on a terrifying new weapon they make plans to get it to the Republic, a last bastion of democracy. The elder Floods send their children away first, with a copy of the data, and plans to meet them within two weeks. Unfortunately, Selena learns her parents were captured and tortured. Taking Simon, she flees for California, to complete the mission herself. Unfortunately, they must pass through the Middle Wastes, the vast bulk of the continent covered in the inedible vile wheat known as Yellow Locust. In the midst of desolation, the pair come to Fallowfield, an oasis of greenery kept free of the Yellow Locust by a chemical called Compound L. Selena tries to find passage to California, only to learn that winter snows blocked the mountains, and she'd be lucky to find a caravan til spring. Unable to earn decent money in the fields, she turns to pit fighting, a forbidden hobby of hers, and here she catches the eye of Marcus who proposes to take her on a fighting circuit to earn money, then take her to California. Before they can make proper plans, treachery forces Selena to flee Fallowfield without Simon. As she works to get back to him, things within the town begin heating up as the sharecroppers plot rebellion against the merchants who have grown fat from their labours whilst leaving them to starve. I absolutely loved this story! Yes, it was similar to many other dystopic stories out there today. It's a current popular genre. Yet while they all share similar themes by necessity, I find most enjoyable. What can I say? I love the genre. This story has not only the war element, but the far more terrifying and implacable element of man Vs nature. The Yellow Locust wheat has taken over the continent (perhaps the world, we don't know). It is the ultimate invasive species, outgrowing and overgrowing everything, and it's completely inedible. It makes kudzu look like a darling houseplant. Despite the thoroughly decimated population, New Canaan wants to make war on far California. Like The Handmaid's Tale, New Canaan, situated in the current 'Bible Belt’ of the US, has utterly trampled everything Christianity is supposed to stand for, ripping outdated obscurities from the Old Testament alone to justify horrendous and close-minded behaviour. I love stories where such societies get thoroughly trounced, and I hope it's the case here, but we’ll have to wait til the next book to learn more. I liked the interaction between Selena and Simon. He's only eleven, and they come to have very different beliefs about what they should do now that their parents are gone. Simon doesn't have the constitution to travel through the harsh landscape like Selena does. He's young, and he's been pampered in a way. He thinks they should stay in Fallowfield. The Mayor has even given him a job making paintings. Painting was considered folly in New Canaan, so this turn makes Simon feel useful and appreciated. Fallowfield has its darkness too, as much as New Canaan. There's the stark class disparity, enforced by the brutal Bernard, captain of the Shepherds, the ‘lawkeepers’. Really, they are all a bunch of bullies. And there's the pit fighting, which serves as a social release valve among lower classes not just in Fallowfield, but New Canaan, and other settlements as well. That's where Marcus comes in. He's a fighter, but he recognises Selena’s talent and makes a deal with her. She helps him get the cash he needs to pay back a steep debt, and he will see her safe to California. He was my favourite character. He's quite the mercenary, but a great person to have by your side in a serious fight. Overall, a great read, and I really want the next one now! It's definitely meant for older audiences with the graphicness of some scenes. ***Many thanks to Chapter by Chapter Tours and the author for providing an egalley in exchange for a fair and honest review. I liked the setting of what might be a post - ecological warfare America. Joschko could have taken that a little further - a 'prequel' could improve YL after the fact. Some highly accomplished writer whose name escapes me has noted that adjectives can be an enemy of good writing. An author should cooperate with the reader, providing the plot and action, while the reader provides the fine details of scenery. Joschko slows the reader down excessively with adjective - laden descriptions of events. I liked the setting of what might be a post - ecological warfare America. Joschko could have taken that a little further - a 'prequel' could improve YL after the fact. Some highly accomplished writer whose name escapes me has noted that adjectives can be an enemy of good writing. An author should cooperate with the reader, providing the plot and action, while the reader provides the fine details of scenery. Joschko slows the reader down excessively with adjective - laden descriptions of events. One need not "dodge and parry quickly". Such actions always take place quickly. One only needs to dodge and parry. "The farms were hard to tell apart in the dark, but Simon’s target was fairly easy to spot. The silo thrust skyward like some colossus’ skeletal finger, admonishing the gods for its premature burial. Its metal skin shone bone pale in the moonlight, the patches of rust like blood stains indifferently rinsed away. Simon gripped the ladder." This text about a silo gets a bit over the top. Action and poetry do not always mesh well. I liked the premise of the story but the flow of the book was a bit slow for me. Serena seemed to have unnatural speed and a gift for fighting but I really don't understand how she got so fast/good. The characters were likable. I just didn't get as involved with them as I would have liked. It was better a little after midway and ended on an opening for the next book. I received an ebook at no charge for which I voluntarily provided an honest review. The thing about this is that... it’s a good story. It gets a little grandiose in language throughout, so that could be toned down and maybe smoothed over a bit. It lacks character development and feels rushed and unexplained in some parts, but it’s a good beginning. Excited to see how the author progresses. The book started good, then it got incomprehensible as to who was who and went downhill from there.